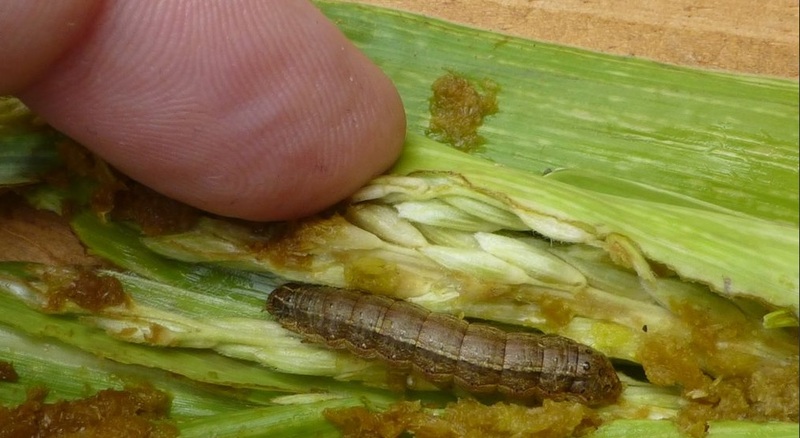 The Fall Armyworm (FAW) (Spodoptera frugiperda) is a Lepidopteran pest that feeds in large numbers on leaves and stems of more than 80 plant species, causing major damage to maize, rice, sorghum, sugarcane but also other vegetable crops and cotton. Fall armyworm is native to tropical and subtropical regions of the Americas. In 2016 it was reported for the first time in Africa where it is causing significant damage to maize crops and has great potential for further spread and economic damage. consequences of these responses? What innovative ideas might work better? Find out and share your insights during this carbon-FREE E-CONFERENCE on responding to the Fall Armyworm outbreak in Africa from 22-26 October 2018. Subscribe here to join daily sessions on various aspects of responding to the FAW outbreak in Africa and access an online platform to meet, share work and discuss with others. The e-conference and the online platform will result in a shared action agenda that everyone can contribute to. The Fall Armyworm Portal - launched by CABI in September 2018 - contains a wide range of news, research, practical extension materials, videos and other resources on fall armyworm. The information comes from many organisations and sources. This portal is part of Invasive Species Compendium portal with over 200,000 records covering recognition, biology, distribution, impact and management of the world’s invasive plants and animals that are a major threat to the global economy (Invasive species are estimated to cost the global economy over US$1.4 trillion annually) and the environment. The Fall Armyworm Portal forms a central repository for information resources collated from a wide range of contributors including many of the key organisations collaborating in the FAO-led Framework for Partnership for Sustainable Management of the Fall Armyworm in Africa and the Fall Armyworm Research for Development International Consortium. If you have resources that you would like to be included into Fall Armyworm portal, please contact isc@cabi.org. The Invasive Species Compendium repository - with over 1.5 million visits a year - is one of the best source of available open access science resources on the invasive species that have the worst impacts globally. The Invasive Species Compendium has undergone a refreshed design that allows for easy linking to CABI’s toolbox of apps, the recently launched Horizon Scanning Tool (which helps users identify potential invasive species threats to a country, state or province), and pest alerts. The Invasive Species Compendium has undergone a refreshed design that allows for easy linking to CABI’s toolbox of apps, the recently launched Horizon Scanning Tool (which helps users identify potential invasive species threats to a country, state or province), and pest alerts. conducted major communication campaigns to promote awareness and management of Fall armyworm (Ghana, Uganda, Zambia) and Parthenium (Pakistan); reaching large numbers of people through multiple communication channels. Learn more about AGORA (Access to Global Online Research in Agriculture) - managed by the Food and Agriculture Organization (FAO) of the United Nations in partnership with Cornell University and up to 85 of the world’s leading science publishers. Learn more about AGRIS: INTERNATIONAL INFORMATION SYSTEM FOR THE AGRICULTURAL SCIENCE AND TECHNOLOGY - managed by the Food and Agriculture Organization (FAO) of the United Nations.